Sankalp '14, a social of SIMSREE, was held with great fanfare on March 2, 2014. Organized by the Student Social Responsibility (SSR) Committee at SIMSREE, Sankalp is about creating an impact in society by creating awareness about burning social issues. It counts on the decision-making capability of MBA students to generate solutions for social organizations in need. Last year, Sankalp’s theme was ‘Empowerment of Women’ and it was a resounding success. This year, in light of the 2014 elections, ‘Voting Awareness’ theme was chosen casting a spotlight on voting in India. Factors such as social media, the AAP, endless scams and indecisive leaders have led to a reinvigorated voter base, including a huge youth group. However, in the past, this has seldom resulted in a high voter turnout. To remedy this problem, the SSR committee kicked off Sankalp '14 with a hugely successful voter registration drive – in association with ‘Vote for a Better India’ – on Republic Day. This was followed up by a viral video competition on social media, which reached thousands of people in the youth demographic. On March 2, the main event kicked off with an addressal by eminent filmmaker and activist Mr. Ashoke Pandit and Prof. Sangeeta Pandit (HOD Finance, SIMSREE). After a short break, the case competition kicked off with Dr. Anup Ramani and Prof. Sangeeta Pandit serving as judges. This competition was tailored around a live case in association with the ‘Indian Cancer Society’. Participants were tasked with solving a problem faced by ICS. After this, the event continued with a social B-plan competition judged by Mr. Anil Agarwal (Head of Corporate Financial Planning and Analytics at Syntel), Mr. Sugato Basu (GM - Corporate Marketing, Syntel) and Mr. Sandeep Varma. The four finalists in this event presented fascinating ideas backed by facts and figures. The final event of the day was a debate competition with three invigorating and vociferous rounds. 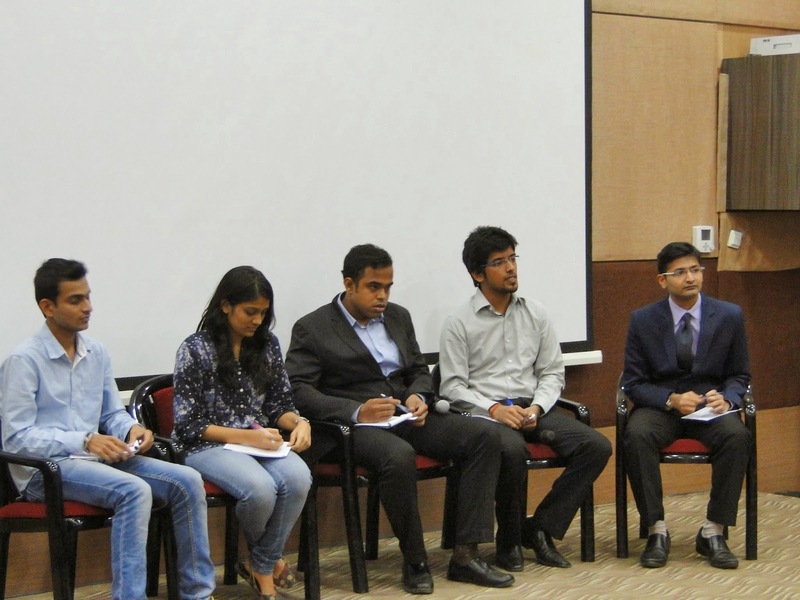 The debate was judged by Ms. Charulata Ravi Kumar, Dr. Agnelo Menezes and Mr. Roy Varghese. High calibre participants and jury members ensured that the three events were very successful. We are thankful to our sponsors Union Bank of India, HDFC Mutual Fund and Charagh Din; without whom it wouldn't have been possible for us to conduct this event on such a grand scale. We are also grateful to Prof. Sangeeta Pandit, Dr. R.K.Srivastava and Prof. Aashish Pawaskar who constantly encouraged us and helped us whenever required.